The DNA of prokaryotes is organized into a circular chromosome, supercoiled within the nucleoid region of the cell cytoplasm. Proteins that are needed for a specific function, or that are involved in the same biochemical pathway, are encoded together in blocks called operons. For example, all of the genes needed to use lactose as an energy source are coded next to each other in the lactose (or lac) operon, and transcribed into a single mRNA. In prokaryotic cells, there are three types of regulatory molecules that can affect the expression of operons: repressors, activators, and inducers. Repressors and activators are proteins produced in the cell. Both repressors and activators regulate gene expression by binding to specific DNA sites adjacent to the genes they control. In general, activators bind to the promoter site, while repressors bind to operator regions. 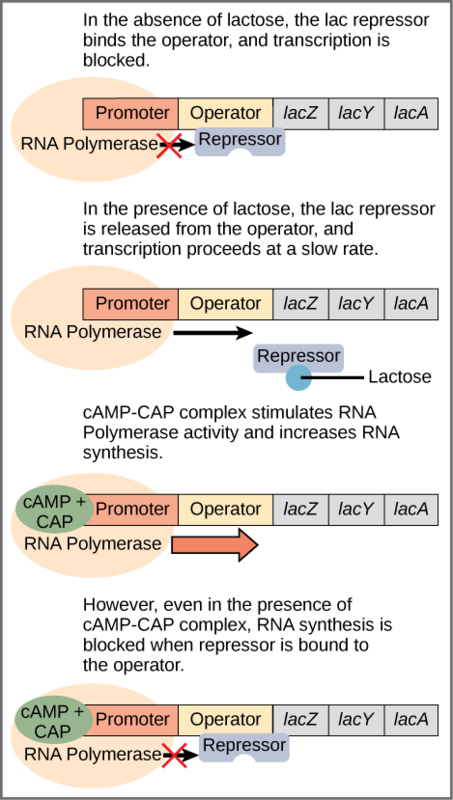 Repressors prevent transcription of a gene in response to an external stimulus, whereas activators increase the transcription of a gene in response to an external stimulus. Inducers are small molecules that may be produced by the cell or that are in the cell’s environment. Inducers either activate or repress transcription depending on the needs of the cell and the availability of substrate. Bacteria such as Escherichia coli need amino acids to survive, and are able to synthesize many of them. Tryptophan is one such amino acid that E. coli can either ingest from the environment or synthesize using enzymes that are encoded by five genes. These five genes are next to each other in what is called the tryptophan (trp) operon ((Figure)). The genes are transcribed into a single mRNA, which is then translated to produce all five enzymes. If tryptophan is present in the environment, then E. coli does not need to synthesize it and the trp operon is switched off. However, when tryptophan availability is low, the switch controlling the operon is turned on, the mRNA is transcribed, the enzyme proteins are translated, and tryptophan is synthesized. The tryptophan operon. The five genes that are needed to synthesize tryptophan in E. coli are located next to each other in the trp operon. When tryptophan is plentiful, two tryptophan molecules bind the repressor protein at the operator sequence. This physically blocks the RNA polymerase from transcribing the tryptophan genes. When tryptophan is absent, the repressor protein does not bind to the operator and the genes are transcribed. The trp operon includes three important regions: the coding region, the trp operator and the trp promoter. The coding region includes the genes for the five tryptophan biosynthesis enzymes. Just before the coding region is the transcriptional start site. The promoter sequence, to which RNA polymerase binds to initiate transcription, is before or “upstream” of the transcriptional start site. Between the promoter and the transcriptional start site is the operator region. The trp operator contains the DNA code to which the trp repressor protein can bind. However, the repressor alone cannot bind to the operator. When tryptophan is present in the cell, two tryptophan molecules bind to the trp repressor, which changes the shape of the repressor protein to a form that can bind to the trp operator. 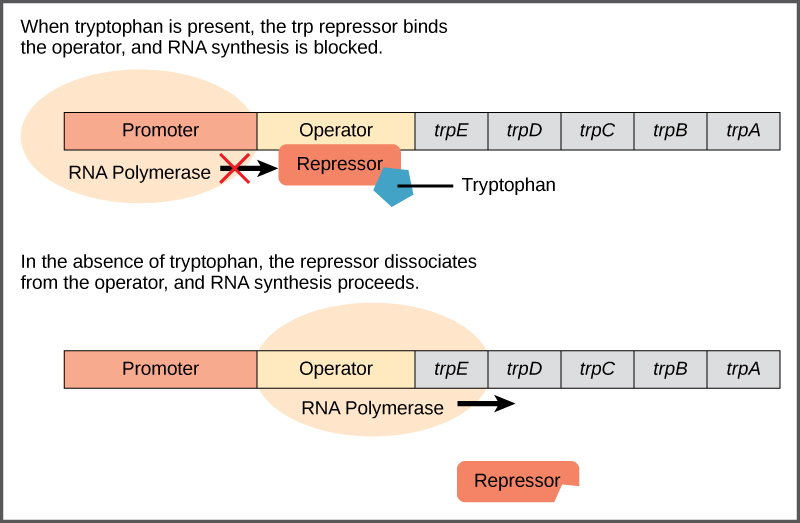 Binding of the tryptophan–repressor complex at the operator physically prevents the RNA polymerase from binding to the promoter and transcribing the downstream genes. When tryptophan is not present in the cell, the repressor by itself does not bind to the operator, the polymerase can transcribe the enzyme genes, and tryptophan is synthesized. Because the repressor protein actively binds to the operator to keep the genes turned off, the trp operon is said to be negatively regulated and the proteins that bind to the operator to silence trp expression are negative regulators. Just as the trp operon is negatively regulated by tryptophan molecules, there are proteins that bind to the promoter sequences that act as positive regulators to turn genes on and activate them. For example, when glucose is scarce, E. coli bacteria can turn to other sugar sources for fuel. To do this, new genes to process these alternate sugars must be transcribed. When glucose levels drop, cyclic AMP (cAMP) begins to accumulate in the cell. The cAMP molecule is a signaling molecule that is involved in glucose and energy metabolism in E. coli. Accumulating cAMP binds to the positive regulator catabolite activator protein (CAP), a protein that binds to the promoters of operons which control the processing of alternative sugars. 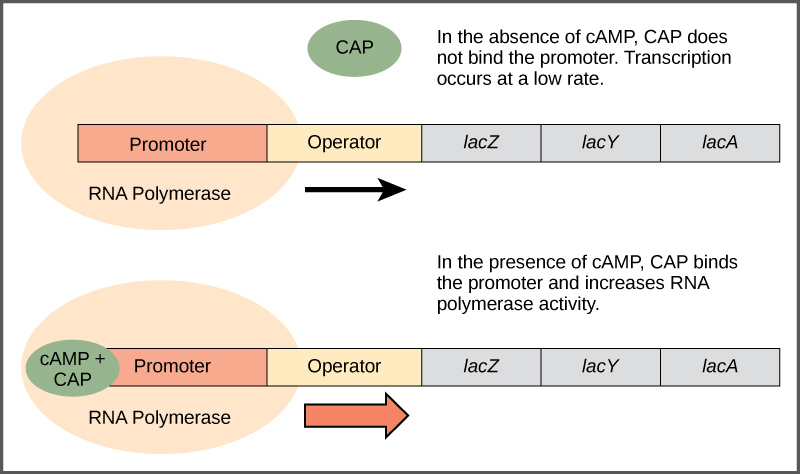 When cAMP binds to CAP, the complex then binds to the promoter region of the genes that are needed to use the alternate sugar sources ((Figure)). In these operons, a CAP-binding site is located upstream of the RNA-polymerase-binding site in the promoter. CAP binding stabilizes the binding of RNA polymerase to the promoter region and increases transcription of the associated protein-coding genes. Transcriptional activation by the CAP protein. When glucose levels fall, E. coli may use other sugars for fuel but must transcribe new genes to do so. As glucose supplies become limited, cAMP levels increase. This cAMP binds to the CAP protein, a positive regulator that binds to a promoter region upstream of the genes required to use other sugar sources. The third type of gene regulation in prokaryotic cells occurs through inducible operons, which have proteins that bind to activate or repress transcription depending on the local environment and the needs of the cell. The lac operon is a typical inducible operon. As mentioned previously, E. coli is able to use other sugars as energy sources when glucose concentrations are low. One such sugar source is lactose. The lac operon encodes the genes necessary to acquire and process the lactose from the local environment. The Z gene of the lac operon encodes beta-galactosidase, which breaks lactose down to glucose and galactose. However, for the lac operon to be activated, two conditions must be met. First, the level of glucose must be very low or non-existent. Second, lactose must be present. Only when glucose is absent and lactose is present will the lac operon be transcribed ((Figure)). In the absence of glucose, the binding of the CAP protein makes transcription of the lac operon more effective. When lactose is present, it binds to the lac repressor and changes its shape so that it cannot bind to the lac operator to prevent transcription. This combination of conditions makes sense for the cell, because it would be energetically wasteful to synthesize the enzymes to process lactose if glucose was plentiful or lactose was not available. Regulation of the lac operon. Transcription of the lac operon is carefully regulated so that its expression only occurs when glucose is limited and lactose is present to serve as an alternative fuel source. In E. coli, the trp operon is on by default, while the lac operon is off. Why do you think this is the case? If glucose is present, then CAP fails to bind to the promoter sequence to activate transcription. If lactose is absent, then the repressor binds to the operator to prevent transcription. If either of these conditions is met, then transcription remains off. Only when glucose is absent and lactose is present is the lac operon transcribed ((Figure)). Watch an animated tutorial about the workings of lac operon here. The regulation of gene expression in prokaryotic cells occurs at the transcriptional level. There are two majors kinds of proteins that control prokaryotic transcription: repressors and activators. Repressors bind to an operator region to block the action of RNA polymerase. Activators bind to the promoter to enhance the binding of RNA polymerase. Inducer molecules can increase transcription either by inactivating repressors or by activating activator proteins. In the trp operon, the trp repressor is itself activated by binding to tryptophan. Therefore, if tryptophan is not needed, the repressor is bound to the operator and transcription remains off. The lac operon is activated by the CAP (catabolite activator protein), which binds to the promoter to stabilize RNA polymerase binding. CAP is itself activated by cAMP, whose concentration rises as the concentration of glucose falls. However, the lac operon also requires the presence of lactose for transcription to occur. Lactose inactivates the lac repressor, and prevents the repressor protein from binding to the lac operator. With the repressor inactivated, transcription may proceed. Therefore glucose must be absent and lactose must be present for effective transcription of the lac operon. (Figure) In E. coli, the trp operon is on by default, while the lac operon is off. Why do you think that this is the case? (Figure) Tryptophan is an amino acid essential for making proteins, so the cell always needs to have some on hand. However, if plenty of tryptophan is present, it is wasteful to make more, and the expression of the trp receptor is repressed. Lactose, a sugar found in milk, is not always available. It makes no sense to make the enzymes necessary to digest an energy source that is not available, so the lac operon is only turned on when lactose is present. If glucose is absent, but so is lactose, the lac operon will be ________. The ara operon is an inducible operon that controls the production of the sugar arabinose. When arabinose is present in a bacterium it binds to the protein AraC, and the complex binds to the initiator site to promote transcription. In this scenario, AraC is a(n) ________. Describe how transcription in prokaryotic cells can be altered by external stimulation such as excess lactose in the environment. Environmental stimuli can increase or induce transcription in prokaryotic cells. In this example, lactose in the environment will induce the transcription of the lac operon, but only if glucose is not available in the environment. What is the difference between a repressible and an inducible operon? A repressible operon uses a protein bound to the promoter region of a gene to keep the gene repressed or silent. This repressor must be actively removed in order to transcribe the gene. An inducible operon is either activated or repressed depending on the needs of the cell and what is available in the local environment. Prokaryotic Gene Regulation by OpenStax Biology 2nd Edition is licensed under a Creative Commons Attribution 4.0 International License, except where otherwise noted.